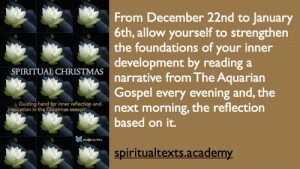 New book: Spiritual Christmas – guiding hand for inner reflection and inspiration in the Christmas season. Free download. 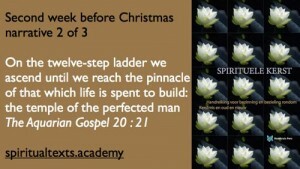 In November 2016 the book ‘Spiritual Christmas – guiding hand for inner reflection and inspiritation during the Christmas season’, was published’ by Rozekruis Pers, Haarlem, the Netherlands. 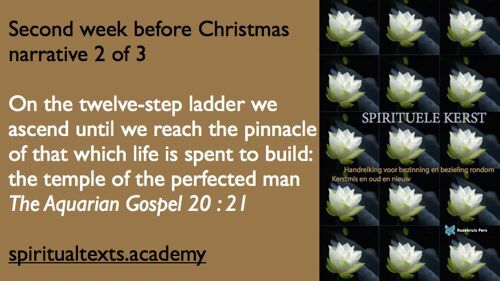 It is the English translation of the Dutch book ‘Spirituele Kerst’ by André de Boer and Tanja Rozema. 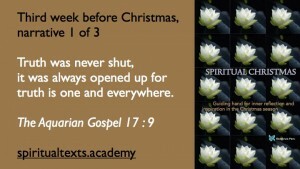 inspiration during the season of the Holy Nights and the Holy Days? Countless people have preceded you and experienced its beneficial influence. 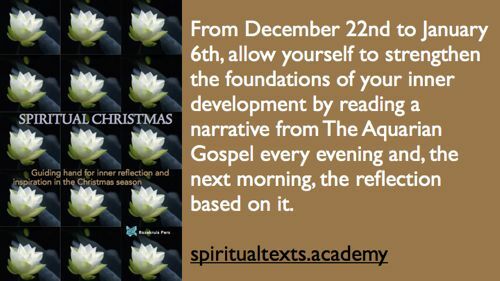 From December 22nd to January 6th, allow yourself to strengthen the foundations of your inner development by reading a narrative from The Aquarian Gospel every eveninthe next morning, the reflection based on it. This entry was posted in christianity, Christmas on 12/17/2016 by Administrator. One day as Jesus and Lamaas walked alone in plaza Jagannath, Lamaas said, my Jewish master, what is truth? This entry was posted in christianity and tagged Aquarian Gospel, christmas, Jesus, Lamaas, Levi on 12/15/2016 by Administrator. In the unity, de daimons sing the praise of God, they loose their malignity and their wrath. By the binary, the fishes of the Zodiac sing the praise of God, the snakes of fire intertwine around Hermes’ staff and the thunder becomes harmonious. This entry was posted in Geen categorie and tagged Apollonius, Apollonius of Tyana, Nuctemeron, twelve hours on 12/13/2016 by Administrator. This entry was posted in christianity, Christmas and tagged Angeus Silesius, Birth, christmas, Jacob Boehme, Jesus, light, Mary, son on 12/13/2016 by Administrator. 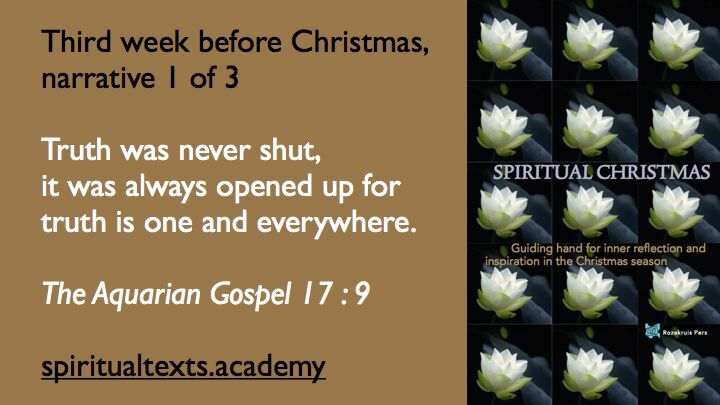 The texts brought me many happy moments – deeply joyful feelings – and I will certainly think back to them often. Lovely to start and end the day in this way. 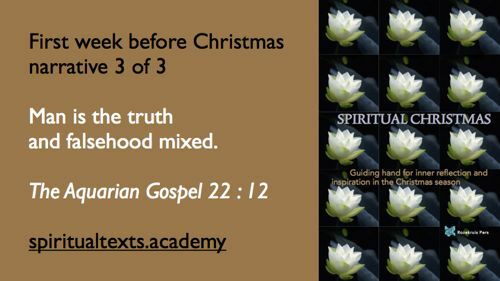 The deepening texts were a confirmation for my soul path. Life is so much greater than we can see. That’s what makes life so wonderful and unique. 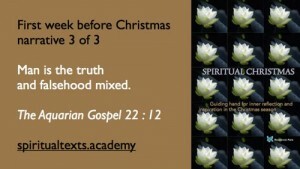 This entry was posted in christianity on 12/11/2016 by Administrator. Now, Rabbi Barachia of the synagogue of Nazareth, was aid to Mary in the teaching of her son. One morning after service in the synagogue the rabbi said to Jesus as he sat in silent thought, Which is the greatest of the Ten Commands? This entry was posted in christianity and tagged Aquarian Gospel, Barachia, Jesus, Rabbi, truth on 12/03/2016 by Administrator.